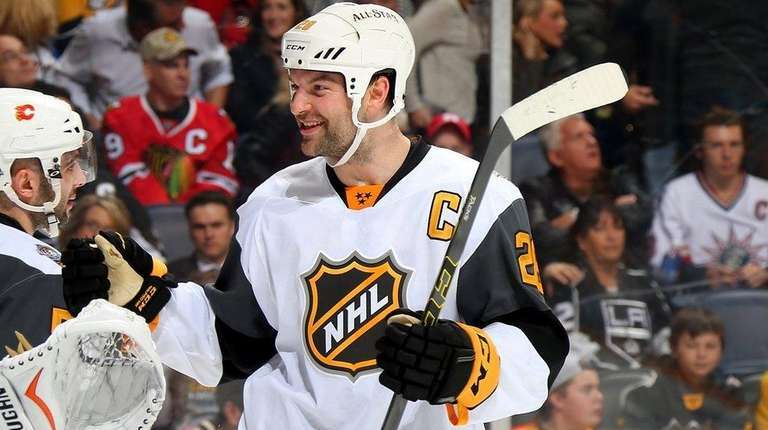 NASHVILLE, Tenn. — It was a hockey lifetime of experiences wedged into one improbable evening, so much so that John Scott found himself Sunday night repeatedly looking back and coming up short of words to describe it all. How much space do we have here? There were the two goals for the Pacific Division — which he captained to winning the new All-Star three-on-three tournament. And the mock fight with the Blackhawks’ Patrick Kane. And being lifted off the ice by teammates. And being named MVP. And accepting the winners’ check for $1 million from commissioner Gary Bettman. And having stars from around the league express their support. And securing the Honda SUV that goes to the MVP, and which will come in handy with his wife, Danielle, expecting twins this week. And fans chanting for him to be named MVP after an initial list of three finalists on the video board did not include him. Sure enough, he won in a landslide as a write-in candidate. “It’s just another one on the list of stuff I cannot believe is happening,” he said of fan reaction, both in Bridgestone Arena and across North America, where he has become a folk hero in recent days. The campaign to elect him initially was a joke on the part of fans who stuffed the digital ballot box just to see what would happen in a three-on-three game to a 6-8, 275-pounder known mostly for his fighting skills. He has five regular-season goals in 285 games — including six with the Rangers in 2011-12. Then Scott was traded from the Coyotes to the Canadiens, who sent him to St. John’s, Newfoundland, of the AHL, seemingly disqualifying him for the All-Star Game but turning him into a cause celebre. The NHL ruled he could come to Nashville if he wished, and the rest now is history. Scott scored 47 seconds into the Pacific’s 9-6 victory over the Central. As promised on Friday, he had a celebration prepared for the first goal that would pay homage to a tough guy of the past. But he said he was unable to do a full, Tiger Williams-style stick-ride because Burns got in his way. Later he scored on a breakaway, causing Danielle to celebrate so vigorously she was concerned the twins might arrive earlier than hoped. So it went for a guy who less than a week earlier was venting in an essay in The Players’ Tribune about how he was being treated — and perceived. Someday he will have quite a tale to tell them.